LA loves Chicks on Bikes. Must be true because I had a great reception down there and met some terrific characters. Off to a miserable start, I flew from San Francisco to Longbeach and found my drivers license had expired. No car rental without a valid license, remember that people. And everyone knows you can’t be in LA without a car (or a motorcycle). So I spent the afternoon with the downtrodden masses that waited in line with me at the DMV. 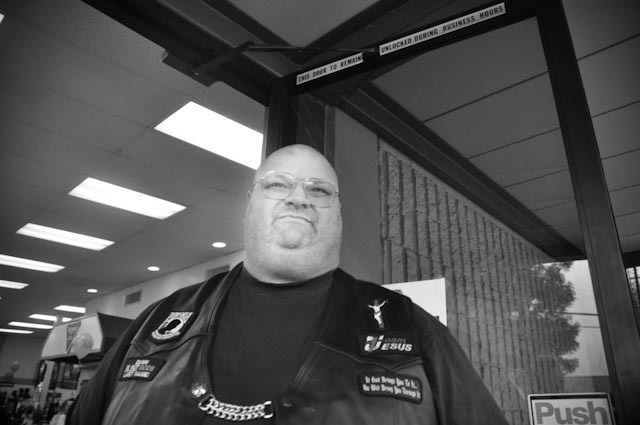 The day took a quick upturn when I was rescued from the DMV by Craig Franz owner of Westminster Harley. They are stocking Chicks on Bikes at their Huntington Beach store. And I took the opportunity to do a few shots of their lovely employee LJ. Check out that foxy tail on the back. Then over to Dainese store for a terrific turnout of about 50 women. I’m a big proponent of wearing good gear, all the time. Dainese has great gear that looks awesome and will save your hide. 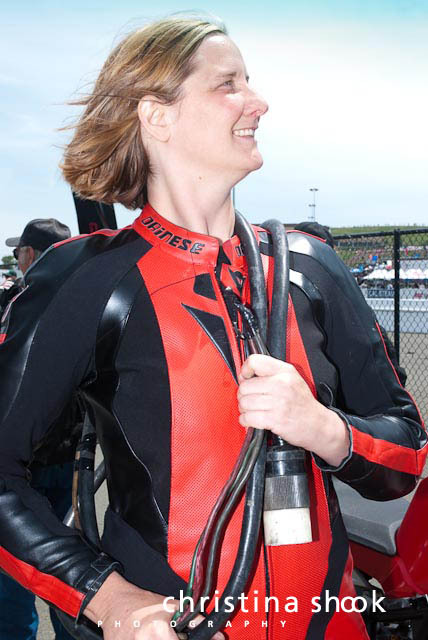 Here’s what fabulous stunt women Leah Peterson says about Dainese gear: Video. Chicks on bikes who wear good gear. Thanks Dainese. Tom Monroe the manager was the gracious host. And here he is with one of the many historical suits they have on display –Eddie Lawson’s, from his 1986 world championship. The store a veritable museum of famous racer leathers. Some are totally trashed and quite interesting to see what a beating leather can take. Powerlily was the sponsor and if you don’t know about this group – go right now to www.powerlily.net Really, go. Don’t even finish reading my blog. But if you’re still reading, I’ll tell you its the spirit of women riders. 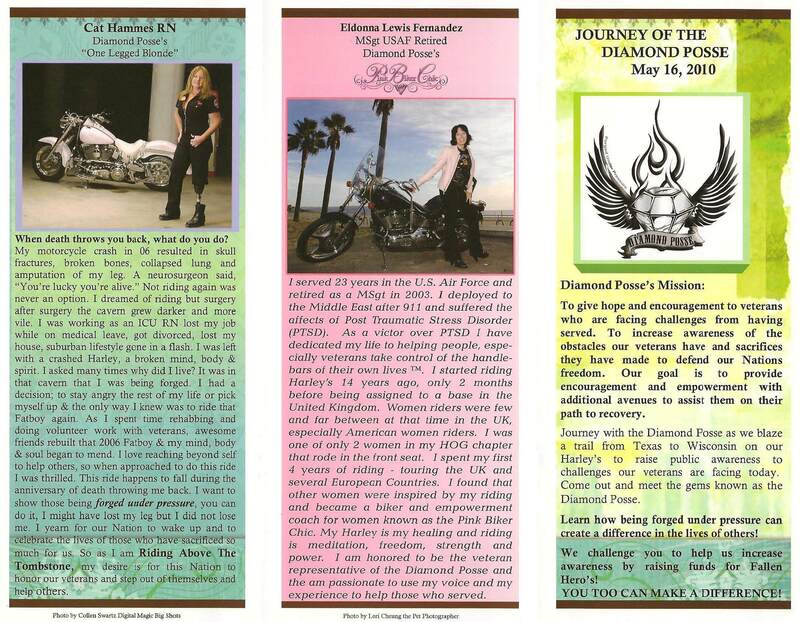 Powerlily has no agenda other than to further the support, kinship and success of women in the power sports industry. Here’s me and the Powerlily founder Jessica Prokup. Coming Next: Cretins Club House and the East Side Motor Babes. I’m not sure the exact age of Bob and Liv as they set off on their Eastern European moto adventure, but I’m going to say somewhat beyond middle age. Add aches and pains and the normal rigors of motorcycle travel to the monstrous conditions they encounter on the roads of Eastern Europe and even a seasoned motorcycle adventurer would shudder. Beyond Bucahrest is a humbling, humorous and charming read as well as an interesting insight into eastern europe. Inspired by Ewan McGregor’s moto adventures the husband and wife team set off on bikes from England to the Black Sea in Bulgaria. They themselves would be daunted if they knew what lie in wait. I won’t plot spoil but the floods are hair raising. Beyond adventure their ulitmate goal it to visit some of the charitable works of EveryChild. All royalties from this book will go to the UK based charity. I’ve recently been thinking about what place the aging motorcyclist has in the bike world. While everyone loves a tale of hardship and overcoming or succumbing to the trials and condition of travel, not many address the added issues of age with the candor and good humor that Bob Goddard does. I feel great empathy for Liv and I cheer for her when her hands freeze up so she can barely control the bike but she rallies on. Due to road conditions…we were cream crackered. And speaking of international distintions, do French motorcyclists really wave their foot in greeting? 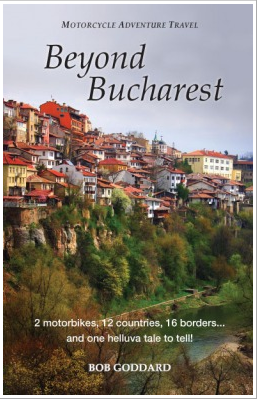 I recommend buying the book Beyond Bucharest for a good cause and reading it for a good adventure. August is the month I gave up on LA many years ago and I sometimes look back at the life I didn’t lead. Within 24 hours of deciding, I’d boxed my few belonging to post and pointed my Yamaha XS11 north to San Francisco where I remain to this day. But that’s another story. 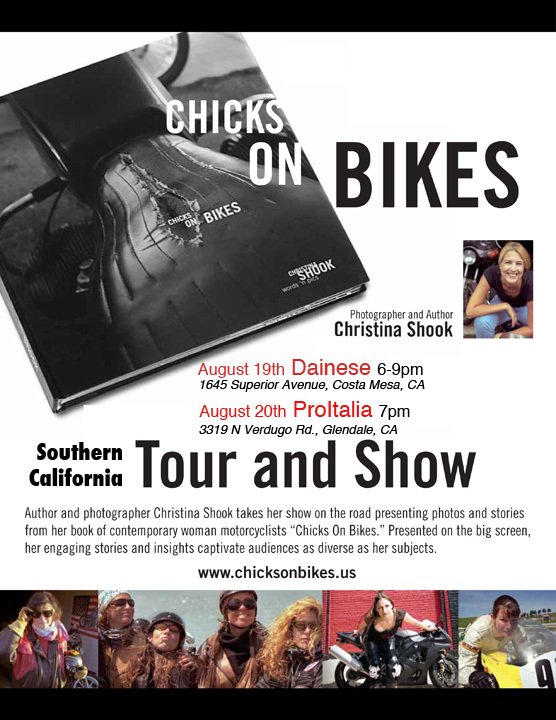 This August, I’m heading down for a few fab dates with Chicks On Bikes. A big thank you shout out to Dainese of Orange County for bringing me down. 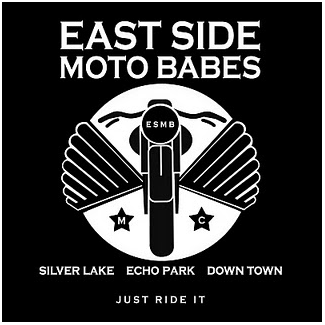 But wait… there’s more…The East Side Moto Babes! (ESBM) Like an awesome indie film, gritty, glamorous and fierce – they laid hollywood rubber in getting me a couple more spots. 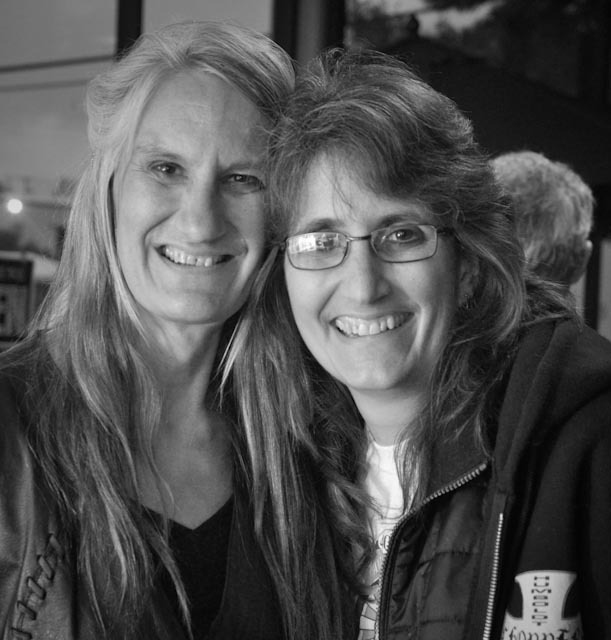 I’d already bonded with the Cretin’s in Seattle last month (pictures at the end of this entry) so I’m psyched that the ESBM is their sister club and hosting me for a late Chicks On Bikes night at the LA Cretins Club House. With a skyline view of the city, I’ll be shooting on the scene. 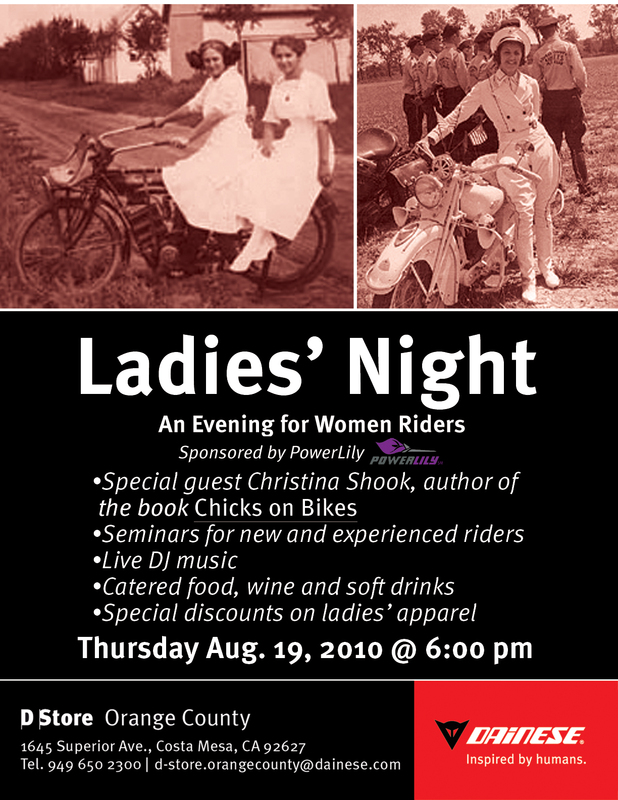 If you’re a chick on a bike, come on down and maybe you’ll be in the next book. ProItalia in Glendale is having their big Cafe Desmo Italian Bike Show. And surely they need some Chicks On Bikes too. The ESBM are coming out for the kick off Cocktail Party at the shop. Look for ramp, Party located on 2nd floor roof parking structure. Here’s a link to her Avon website. 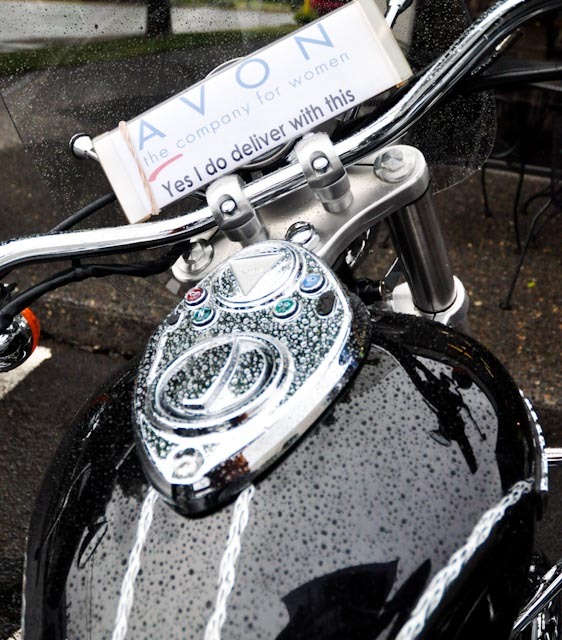 All Portland Bikers should go to Laurie for their Avon needs. And my name in lights! And these two sisters have been riding dozens of years. I love this kind of family and biker bonding. And a special thanks to the R.A.T. Pack for coming out. More to photos and adventures of the northwest to come… because sometimes you just have to get started. I’ll be at a book table with the famous Wall of Death trick rider Cookie Crumb who rode The Wall back in the 50’s. And I’ll be doing my show a couple times daily. Come early 5:30 to view vintage motorcycles and stay late for punk rock band to follow. Come on down Beemer folks – I’m on the cover of BMW owner magazine on the Level next month! 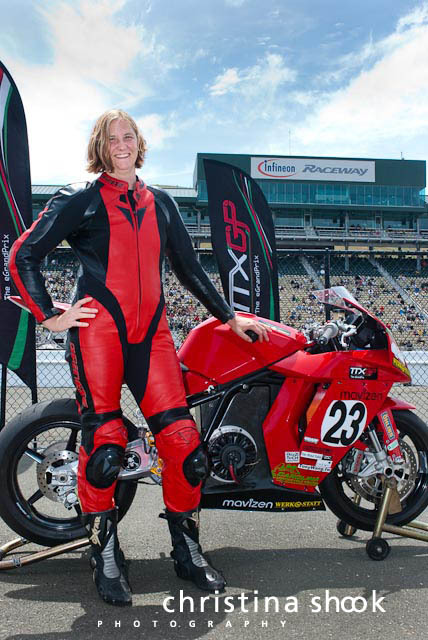 Jennifer Bromme raced the first ever electric motorcycle race in America at TTXGP last month. She’s among my favorite photo muses. There’s so much to say about this that I’m paralyzed into inaction. But does every blog need to tell all? Wouldn’t you rather just see the pictures? Good. Because I find writing really hard work. Hats off to those of you who do it so well and blog so diligently. Read these articles by Suzanna Schick instead. I’ll just get to the photos because that’s what I do. Jane Jetson knows electric bikes are the in thing. What better public image for motorcycling than a mom and her kids thumping up the coast talking about women motorcyclists? Its a good thing, maybe a bit mad, but surely its good. 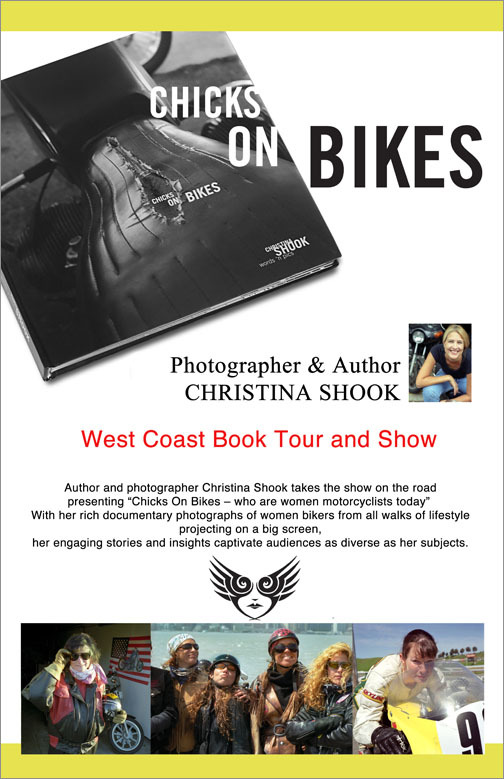 Chicks on Bikes is coming to a town near you (if you live in the Pacific northwest). And what’s best: ITS FREE! Yep, I’ll come dazzle you with my show and afterward sign your Chicks On Bikes book myself with a sparkly silver sharpie. a. love women and at least suspect that women are indeed smarter than men. c. are fascinated with the frozen moments and million words embodied in great photography. e. belong to a motorcycle club. I love clubs, great excuse to gather your buds. My dates are June 26 – July 11th and here is my flyer. Email me through http://www.ChicksOnBikes.us or comment here to contact me. 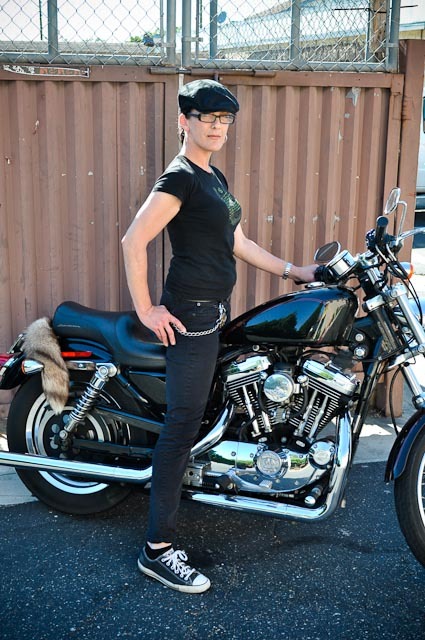 Not a Harley Girl – or am I? I’m a sport bike girl at heart. I like the speed and focus of flicking the bike through a twisty road. I like the tucked in feeling of the bike bonded to my body. I like the hyper, buggy, plastic body work of performance bikes. I like the general demeanor and style of fellow sportbike riders (not the squids). As author of Chicks On Bikes that embraces all kinds of bikes and riders and styles I do my best to disregard personal preferences. I am forever enthused to learn what individuals love about their bikes. The character and the bike they choose are an inseperable part of the story and every rider has a story. But I’m going to confess the big cruisers have never called to me. Its kind of the way I feel about birds – its fascinating to encounter other people’s birds but never ever do I want to own a bird. They’re loud, they poop on you and I don’t like the herky jerky way they move. The maverick in me just does not want to own the #1 selling bike in America, the Harley Davidson. I’ve actually entertained ideas of buying seriously ugly but beloved bikes such as the V-Strom. In part just to be ornery. But as I contemplate doing a major road trip book tour this summer. Possibly with my 9 year old daughter. It behooves me to take an earnest look at the biggest lux touring ride in the Harley stable -the Ultra Classic Electra Glide. I think the wonderful writer photographer Bob Stokestad summed it up well in this article on the Big Mama as he calls it. And from now on I shall call all Ultra Classic Electra Glides Big Mama too. I will just say its the closest thing to a 2 wheeled Lazy Boy and the highly visible color orange with a hue that nods to the 70’s suits me just fine. 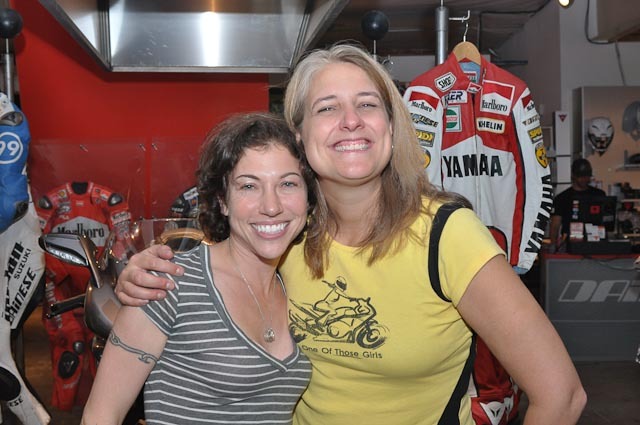 Here is a picture of me and Ella on it at Dudley Perkins Harley dealership in San Francisco at their recent Garage Party. 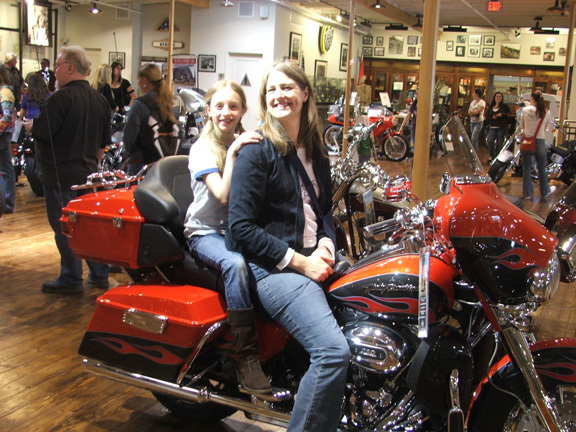 The Garage Parties that Harley dealerships have been putting on this spring are aimed at encouraging women riders. I gotta love that. I give HD a hearty thump on the back for the wisdom of promoting women riders. Its that kind of smart marketing that keeps them the #1 seller. 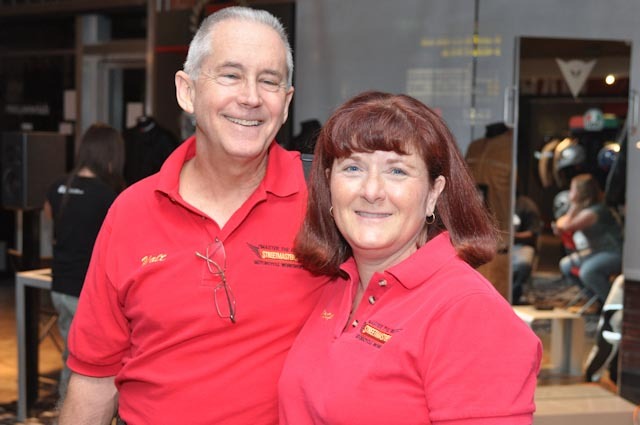 And another kudo to Dudley Perkins, a SF institution, for being such good people. If were plunking down my change to buy a brand new Big Mama, this is where I’d plunk it. I just saw a video where a knee is dragged on a massive Goldwing. Now that’s the kind of rider I want to be, comfy but fast! Giving back to your community is a basic element to a life well lived. If I were to smash myself to bits in a motorcycle accident tomorrow and lay there dying a slow death and taking account of my life, I’d really like to have some good deeds to cough up. The motorcycle community seems to be doing this all the time. Is it because life and death seem a bit more in perspective for bikers? I want to put a plug out for the Diamond Posse. I’ve met a couple of them and they are some big hearted ladies. As they say, they have been “forged under pressure” thus creating diamonds. As past members of the military or lives of personal challenges, these 5 women will set out to ride this May from San Antonio, Texas to Milwaukee, Wisconsin to celebrate Women’s Riders Month stopping at veterans’s centers along the way. They are fund raising for the Fallen Hero’s Fund to build a privately funded physical rehabilitation center. Donations for books.. Heart of a Military Woman Book Donation: Books will be given out to veterans at VA Stops . Proceeds benefit the Fallen Heroes Fund . Contact Eldonna aka Pink Biker Chick for more info. 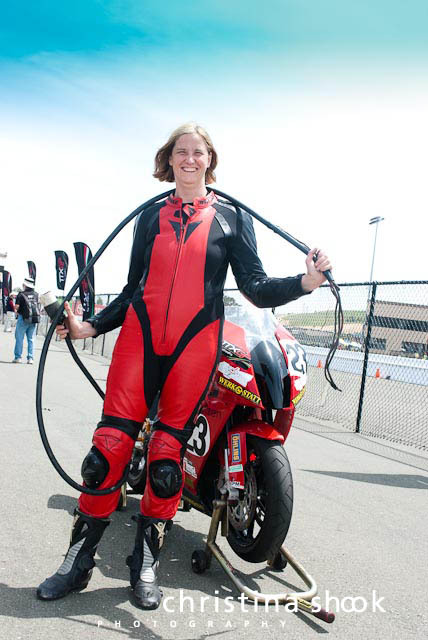 Looks like I’m a bonafide something since I’m actually getting paid for speaking next Month at Santa Rosa College and presenting Chicks On Bikes: what real women motorcyclists are all about. Its National Women’s Month, you know. So I’m spiffing up my slideshow and need some music for the intro. I contemplated many songs and dismissed the most obvious right off the bat. I’m going to make a heretic state right now. The fine old song Born To be Wild is a practically embarrassing cliche. That’s why its not on the list. But first alllow my my motherly rant on ear drums and safety. If you listen while you ride, you’re either cranking it up to hear over wind noise and that causes ear damage. Or you have ear buds that seal out the sound and then you can’t hear around yourself on the road. 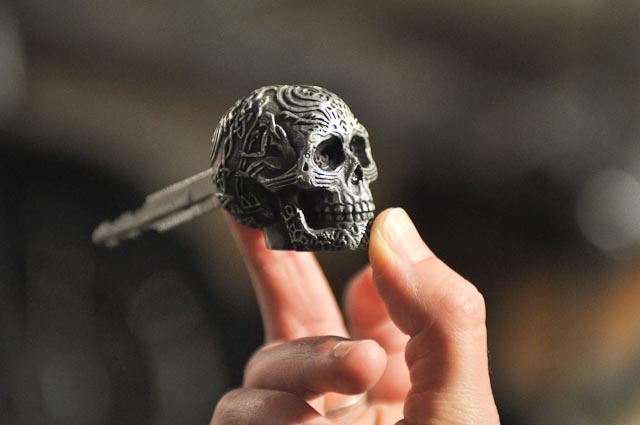 Best to have all your senses sharp. 10. For most bizarre and comic the award goes to: Funky Moped by Jasper Carrot. 9. And just to show you everything sounds better in French – check out this Bridgette Bardot song. I don’t know what she’s saying about that motorcycle but I like it. I’m not even going to ask if she’s ever ridden a motorbike. 6. Fine, I reconsidered Born to be Wild because I did quite enjoy this performance by The Cult. #1. 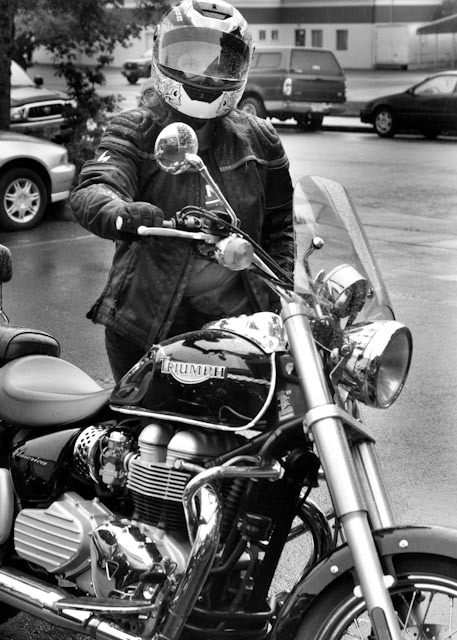 Not because I’ve been particularly concerned with an accurate list of ranking (nor even in a serious critique of the genre of motorcycle songs) but the song that won me over to go with my Chicks On Bikes slideshow intro: Two Wheels Move the Soul by true biker chick Sasha Mullins. Now that I’ve had my say, comment and tell us your favorites.